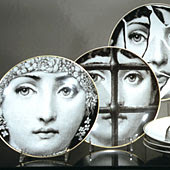 Chances are you are at least familiar with Fornasetti's Julia plates (above). 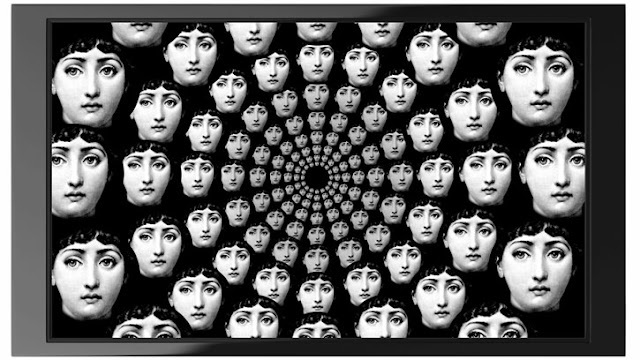 The numerous black and white (sometimes with gold) illustrated porcelain dishes that sport imagery of "julia" (who is actually modeled after a woman named Lina Cavalieri), suns and moons and other Fornasetti themes. 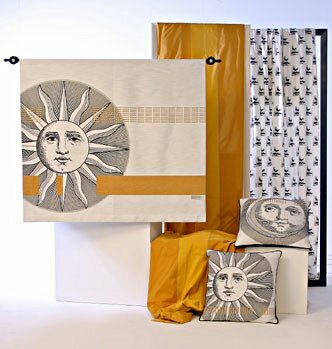 This year two more fabulous collaborative collections (wallpaper and rugs) have been released, along with more ceramic items and Fornasetti furniture. 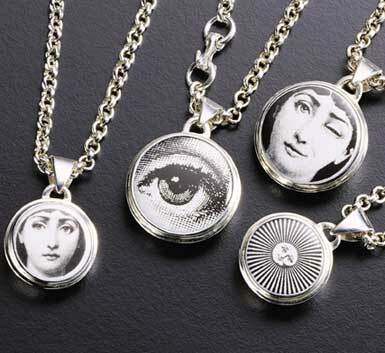 Read on to learn more about these other Fornasetti items, history and frankly, more Fornasetti than you ever needed to know. 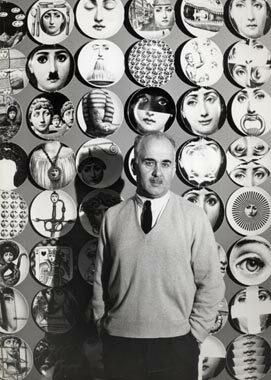 Above: Piero Fornasetti with some plate of “Tema e Variazioni” series behind him. 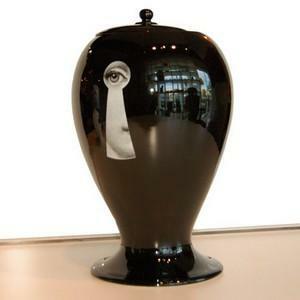 According to Piero Fornasetti a single idea provided the opportunity to develop others ideas. He gave free play to his imagination to the point that most of his work is based on endless variations of several themes. Amongst these, the most recurrent are the sun, playing cards, harlequins, hands, self-portraits and so on. 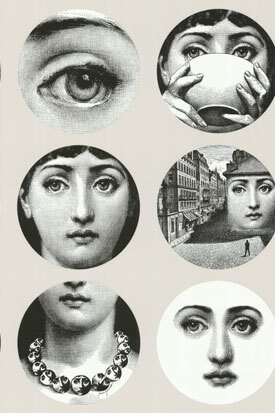 Actually the most famous is the one that Fornasetti himself called "Theme and Variations", published in a tiny, precious book and representing the enigmatic face of a woman. He found it glancing through a French magazine of the 19th century: her name was Lina Cavalieri. Perhaps he chose this face for its archetypal, classic female features. 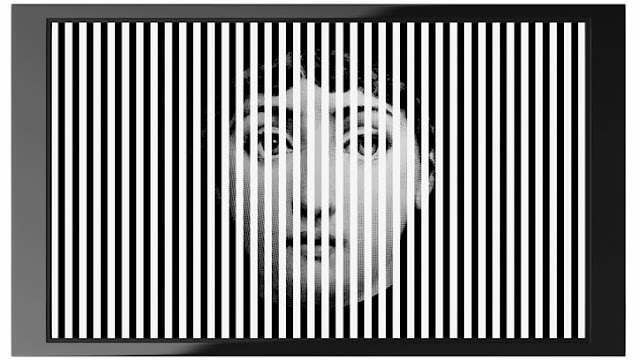 Like a Greek statue and enigmatic like the Mona Lisa she was perfect to be moulded into the idea Fornasetti had in his mind. This Mona Lisa is caught winking, transformed with a Charlie Chaplin style mustache, inserted in to a pub sign, a television, the facade of a building, a ring, or multiplied in a bunch of grapes, she becomes the face of a clock, tattooed, cut in to pieces, distorted, framed in a triangle or simply seen wearing glasses. 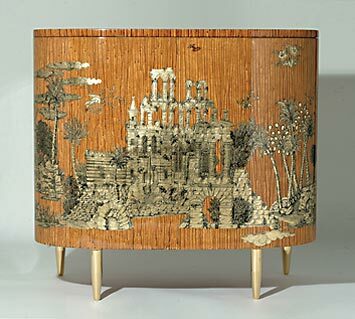 With great modesty, all this work was reproduced on a series of everyday objects like plates, ashtrays, umbrellas stands and trays. 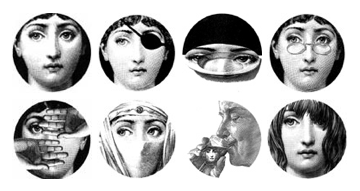 At the beginning there were only six white plates decorated with black and white designs representing a female face. Then this series has spontaneously increased during the years until it reached 350 different variations on the theme of classical beauty. 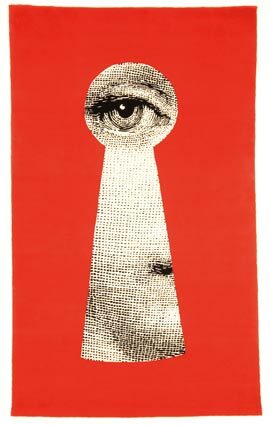 Piero Fornasetti, born in 1913, was a Milan painter, a sculptor, an interior decorator, an engraver of art books, a creator of more that 11,000 items, a deviser of sceneries and customs, an organizer of international exhibitions and events. 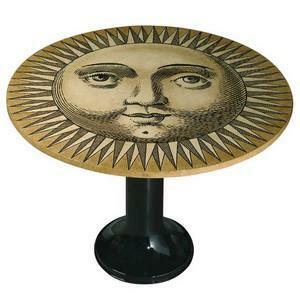 As far as the variety of decorations is concerned, Fornasetti’s production of objects and furniture is one of the largest of the 20th century. The lesson deriving from his oeuvre is the rigour with a strong imagination and an elegant and mystical sense of humour. 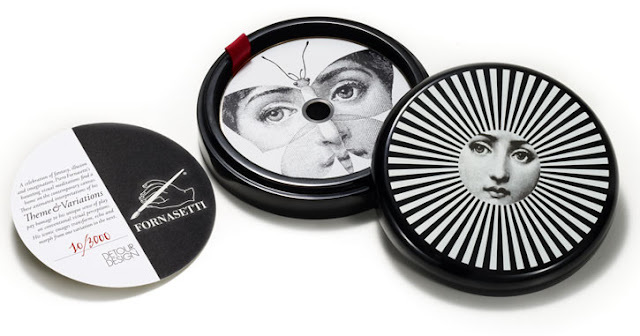 Fornasetti’s son, Barnaba, is perpetuating the workshop tradition, continuing the production and reviving the most popular pieces, creating new ones, renewing hand crafted production, in collaboration with industries which manufacture under license. 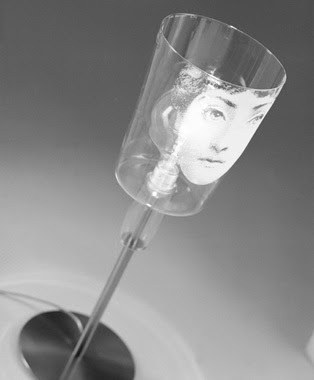 A collection of new products was born like this: from fashion accessories such as ties, scarves, waistcoats, umbrellas, to hold house articles such as china, furniture, lamps, fabrics, linen, radiators, tiles and many other items spreading joy into our everyday life so full of minimalist and “expiatory purism”. 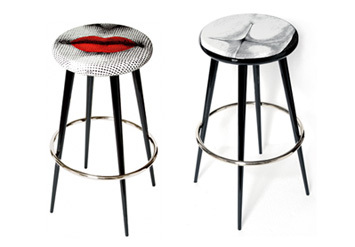 Believing strongly in design – the practice of sketching and copying – as the legacy of the Italian artistic tradition, his unique style shows a strong sense of irony. 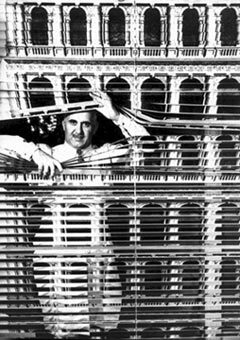 He worked independently of the avant-garde and his production of exquisitely made objects, textiles and furniture, some of which are in the V&A Museum, is one of the largest of the 20th century. 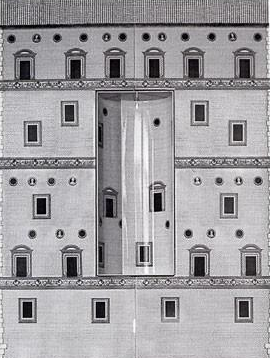 Above: Fornasetti's version of a Venetian blind reproducing the “Procuratie Nuove” the building that lines one side of Piazza San Marco. 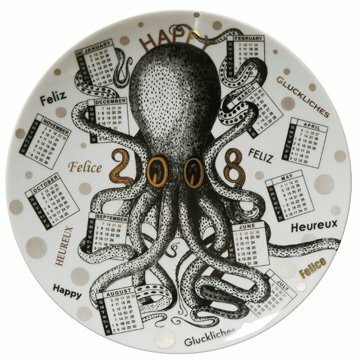 Classic Fornasetti Tableware is available at Barney's, and etabletop,who offers the largest collection of existing Julia plates, no longer being produced. Moss also offers some Julia plates, many special editions made for Moss only. Back to Creation with a good looking Italian and a collection of wallpapers - Adam and Eve, created by Piero Fornasetti in 1954 and Hydrangea from Fornasetti’s garden or even the Garden of Eden, an exquisite original drawing discovered in the Fornasetti archives and adapted as large scale wallpaper by Karen Beauchamp, Creative Director of Coles. 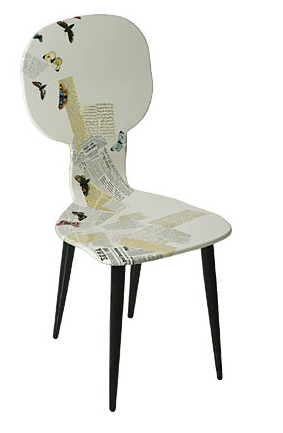 These Fornasetti wallpapers are hand screen printed by Cole & Son. 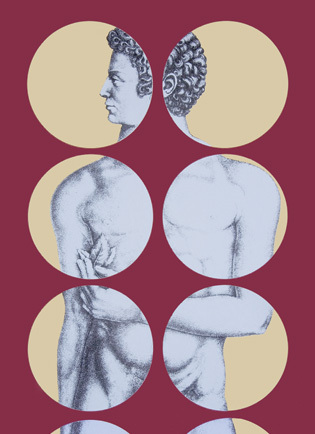 With Fornasetti, nothing is ever quite as it seems - the classically inspired figures of Adam and Eve are seen through a screen of colour in which twelve fretwork circles provide an intriguing ‘trompe l’oeil’ view of the figures. 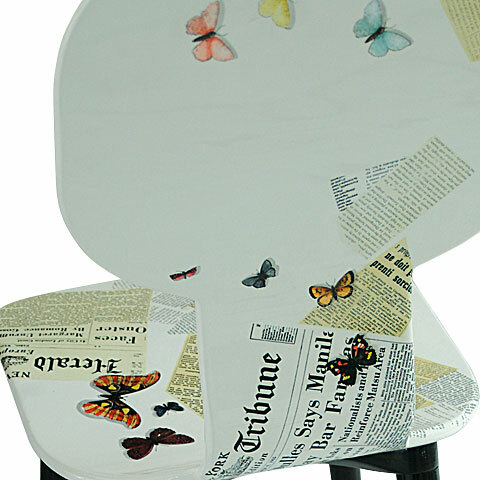 The effect is typical of Fornasetti’s bizarre and humorous style, inspired by his skillful drawings from nature and classical sources. 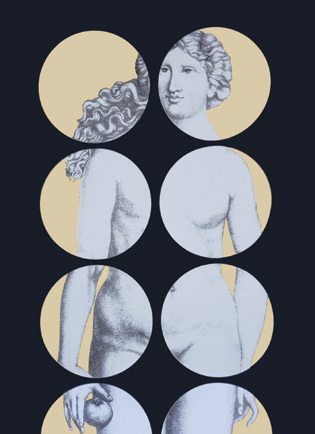 The figure of Adam finely drawn by Fornasetti is in black on white and gold against a wine red ground, a colour he favoured, while Eve, the serpent coiled at her feet, is in black, white and gold on an ink black ground. 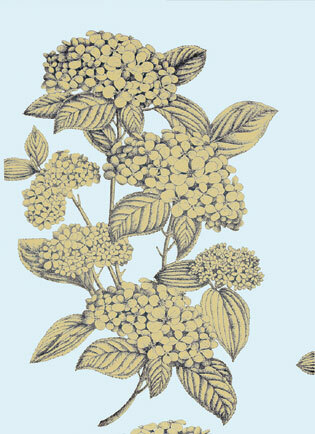 Hydrangea is in two colourways – black and white on an opulent gold ground or black and gold on a pure cerulean sky blue. 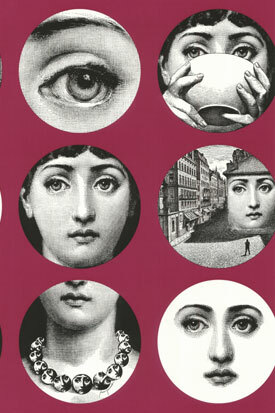 All wallpapers bear the distinctive Fornasetti signature. The wallpapers play on a theme of Creation – an allegory perhaps for design and craftsmanship uniting two historic companies. The figures of Adam and Eve are an impressive 1.6 meters high with 3 meters of plain background between each image to position as wished. 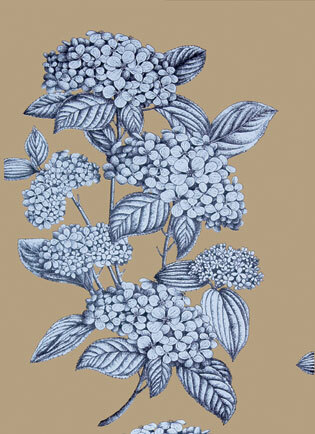 The repeat of Hydrangea is 1.5 meters. 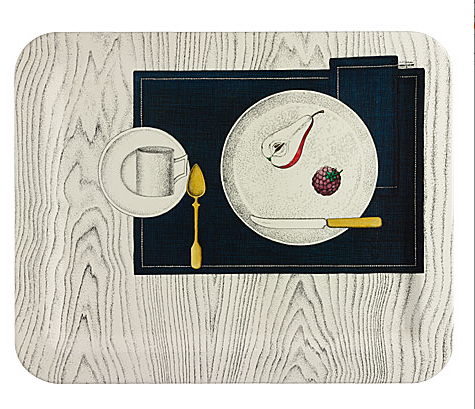 The rugs by Roubini Works of Art created for Fornasetti, reflect his unique style. The great illusionist is aptly represented with his whimsical perception of life’s objects, architecture, nature and variations on a theme. 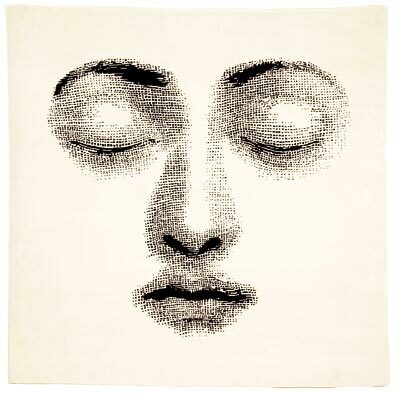 Piero Fornasetti applied his decorative vocabulary to an astonishing array of commonly found objects to which Roubini has added a line on magnificent rugs, hand knotted in wool and silk and available in standard as well as custom sizes. 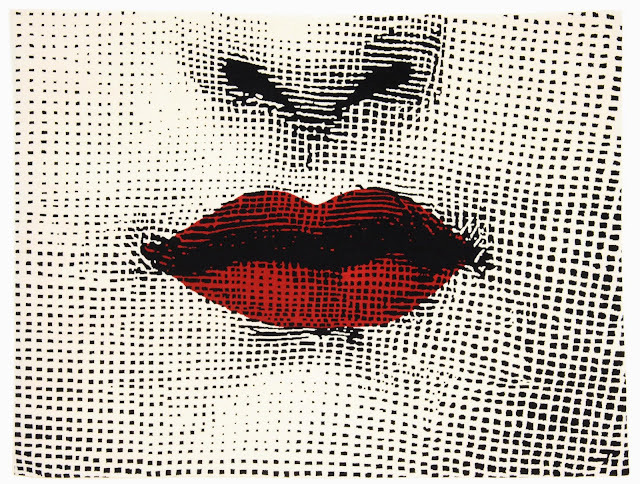 See the whole Roubini collection of Fornasetti rugs here. 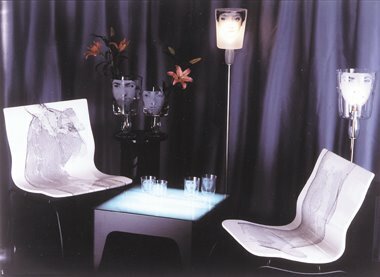 The collection includes vases, glasses, lamps and chairs. 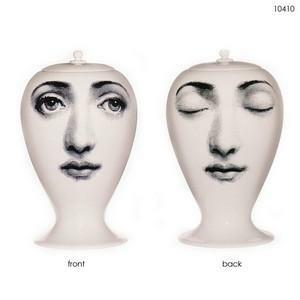 Above: a product of a collaboration between two of the most creative minds of the twentieth century, the trumeau series remains in our mind as the finest outlet for fornasetti's creative mind. 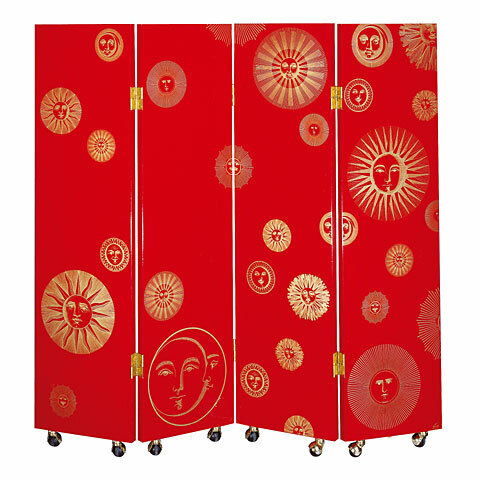 designed by gio ponti, the trumeau has been changed ever so slightly and decorated completely differently over the years, resulting in an incredible overview of fornasetti production and charm. 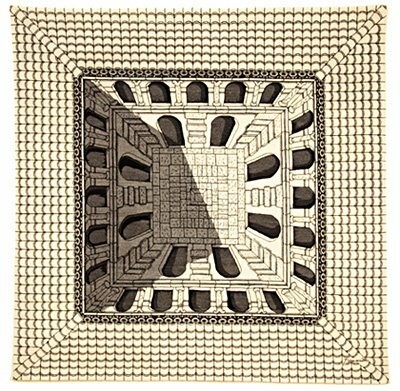 This decor is known as 'architecture'; available in white or ivory ($27,063.00) 31.9" x 15.4" x 86.2"
Available in the motifs: "Bocca" "Tergonomico" "Egocentrismo" Occhio" "Sole". 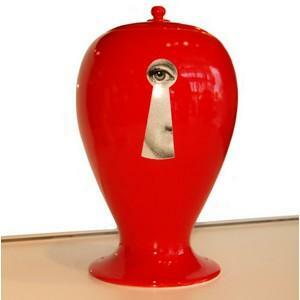 Available from the Fornasetti Atelier. 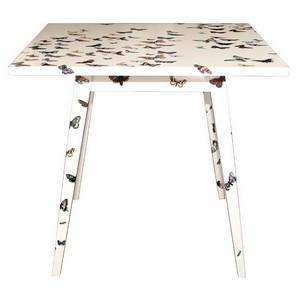 Above: Recently introduced in milan and designed by barnaba fornasetti, the 'butterflies' tables feature a flight of butterflies entirely painted by hand in the atelier in milan. 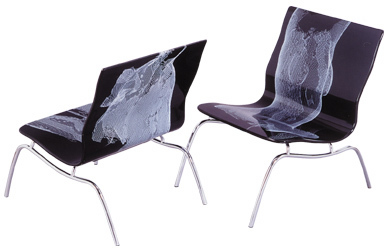 available in white or black versions. 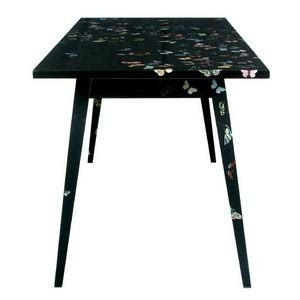 This re-invention by Barnaba Fornasetti has the same shape of the classic Fornasetti curved chest of drawers but it has been visibly elaborated in order to obtain a desk with two doors and writing table. Inside there are several counter tops to contain CDs, papers, desk materials and a drawers with a counter top for a notebook. 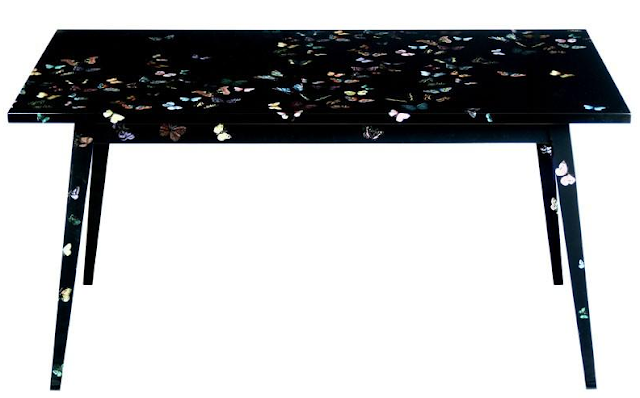 This lacquered wood chest desk is decorated with the motif "Grand Coromandel" in gold leaf on a treated pouring-like background which is sponge painted by hand. 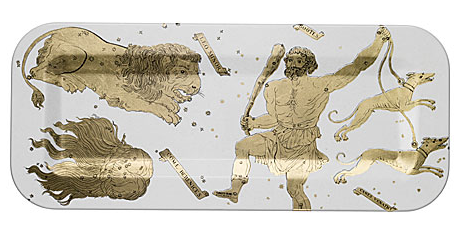 It is available in all the decors of the Fornasetti chest of drawers: "Achitettura", "Palladiana", "Pompeiana", "Fiori nella notte" and "Leopardo". 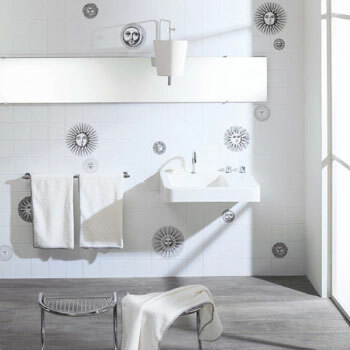 Thanks to the collaboration with Bitossi Ceramiche today it has been possible to realize this project. 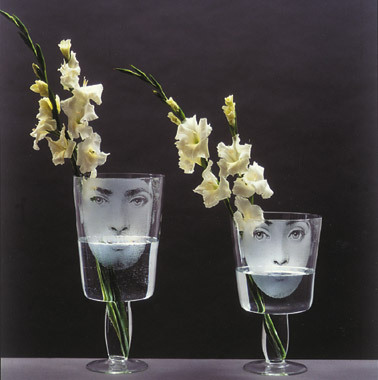 The collection is composed of 4 vases realized in different colours and produced, like the first collection edited in 2005 (which is sold out), in a limited edition of 299 pieces. The above products (and more decor items) can be bought here. Above: set of 6 drinking glasses, available here. The above items (and more) are available here. However, last time I checked, the site and the company seem to be out of business. 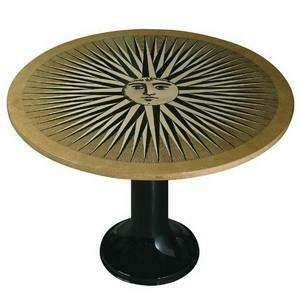 Interested in acquiring some vintage Fornasetti products? These are for sale. 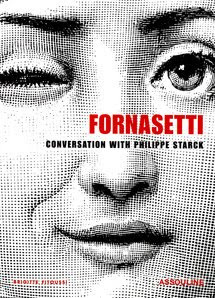 Above: FORNASETTI Conversation with Philippe Starck© 2005 Assouline publishing, New York. Available also in French. buy it here.